In the foyer of the plenary hall held various activities at the start of the receipt of Senators, Christmas Christmas - receiving traditional carol singers - thematic exhibitions, etc.. All here to install the TV news studios, and Senators give interviews to the press. 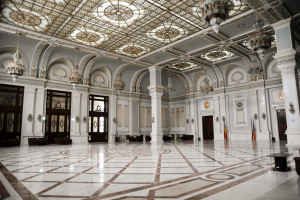 The foyer is decorated with twin pillars of white marble, placed around the perimeter of the room. "Mirrors" has ornate frames with geometric and floral moldings and profiles, apply crystal and brass. Vaults have plaster frames, are separated by double arches with floral motifs. The floor is marble in two colors with geometric decoration, and monumental doors are oak, with boxes and geometric patterns in two wings, with decorative brass fittings. Natural light floods through a skylight foyer is richly decorated with cast bronze items.